Trampolines have for a long time received praise for the numerous benefits related to health that have placed them in a more favorable category when all the trampoline rules for safety are followed. Some of the benefits that come with a consistent, safe routine include stress reduction, weight loss, strengthening of the joints, improved lung and heart function, improved muscles, improved balance and increased blood circulation which strengthen your immune system. Health professionals handling autistic kids have found this form of routine very useful in the treatment of all types of autism. With young kids, improvement has been observed in language development abilities with regular rhythmic jumping. Many studies have been carried out on the health-related benefits brought by trampoline exercises, and there is a lot of information you can access the positive outlooks of owning and using the trampoline. However, it can never be stressed well enough that no equipment is good when you do not use it with skill and safety. Below are some of the necessary rules that parents should use to create a trampoline rules sign to ensure the safety of their children. 8. All children should be supervised while bouncing on the trampoline by an adult. 9. Avoid using the trampoline when you are drunk or under the influence of drugs. Ensure that the children cannot access the trampoline without your knowledge by keeping away all ladders or any other climbing items when you are not around. By doing this, you can avoid any injuries from even from any uninvited guest usage. It is also advisable to keep the mat clear without any shoes, toys and other items that may bring harm to your child while jumping. Nowadays, the best trampolines typically come with most of the essential safety accessories. However, if they are not made available during the time of purchase, make sure to buy, install and use the safety accessories designed for your trampoline model. The safety net is designed to offer the users safety and protection from falls as well as the springs. The shock absorbent pads usually cover and protect the areas that have been known to cause harm in the previous models, and they reduce the occurrence of accidents. You can select from the many safety accessories available by considering the added safety value of each item. You should follow all the guidelines provided by the owner. If there are specific directions given for the assembly of the equipment, then you should follow them to ensure the safety and durability of the trampoline. Additionally, if there are any instructions such as the weight limits, they should also be observed as well. The manufacturer's manual should be kept within reach for review when you want to reassemble the trampoline or replace some parts for any reason. Most of the trampoline injuries occur when there's more than one jumper using the trampoline. Although most children derive excitement when they are jumping with others, do not allow more than one kid to use the trampoline at any single moment. When there are many jumpers on the trampoline, they might jump on one another and injure themselves. Most of them suffer fractures and broken bones due to landing wrongly after bouncing on another jumper. In such instances, the kid weighing less is more likely to get injuries. This tip is important because when the children land at the center of this equipment, their probability of falling off is extremely low. Alternatively, the chances of landing off a trampoline are quite high when the kids land on the trampoline edges, especially close to the frames. Somersaults or any other unsafe moves should be banned for all recreational jumpers. If any exercise stunts, tricks or somersaults are practiced by competitors or for athletic training then the jumpers should be supervised by a professional trainer or spotter. These kinds of exercises have high risks of injuries and are not recommended for recreational or novice use. Most of the children clothing particularly for the boys come with drawstrings. Such clothing is relatively dangerous when bouncing on the trampoline since the strings can get stuck on the safety net poles making the kid land awkwardly which may lead to serious injuries. To avoid such injuries, encourage your child to wear clothes without any drawstrings while using the trampoline. Children are very creative beings, and they want to experiment with their capacity to do something particularly in the absence of their parents or any other adult. When it comes to the trampoline, they will try some moves that they may have watched on YouTube, and eventually, your kid may land wrongly with his neck or head down which might cause some severe permanent injuries. The children can also lose control while on the trampoline and fall off. When you are present as an adult, you will be in a position to monitor how your children are jumping on the trampoline and even stop them when they begin any moves that may potentially pose a danger. Alcohol or drugs can impair your judgment. To ensure the safety of your kids on the trampoline, you should never combine alcohol with bouncing on the trampoline with the kids. In the recent past, many kids have been injured while jumping with adults who have been drinking at garden parties. Trampolines are wonderful for having fun and much better for exercise, workouts, and fitness. Unfortunately, landing off a trampoline can lead to life-threatening injuries, paralysis as well as loss of life. To avoid most of these injuries, ensure that you implement the above trampoline rules for safety measures to make trampoline bouncing a safe and exciting experience for your kids at all times. 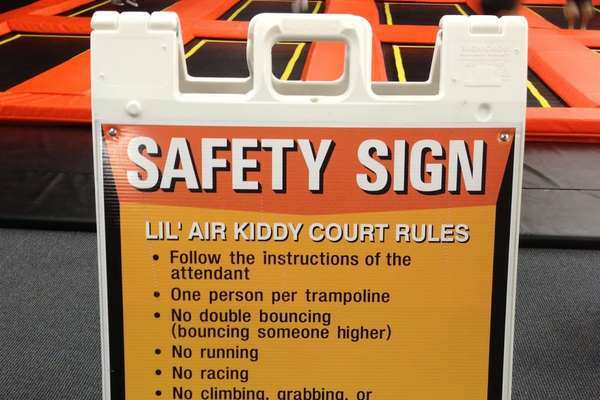 These rules will also help you as a parent to develop a trampoline rules sign for your children and to make sure that everyone enjoys bouncing on the trampoline without any misunderstandings or injuries. You can also purchase trampoline rules signs online from Amazon which are also beneficial for home use.